Mario and Bowser are puttin' their dukes up... on a DANCE DANCE REVOLUTION BATTLE! Who is going to win this epic confrontation between good and evil? May the best dancer win! This picture is mostly a thank you gift for my dearest girlfriend, *lamarce. Her constant presence, support and help in my comic booking "career" (if we can say so) is really one of those things that keep me going on when times get hard. Her help was especially precious during the writing of The 3 Little Princesses. She proved to be a great brainstorming companion when came time to find ideas, or when I just plain hit a wall.  The Whacka Juice (the name, not the idea). She also played the "editor" role by pointing out my typos, and helping with the French translation of the comic. This picture is one of her ideas as well. So I want to ask you all a little favour. If you liked T3LP, instead of commenting here with the usual "good job" kind of message, I ask you to go to her gallery and leave her a message of your appreciation for the ideas she gave for the sake of the comic. If you can't do that, at the very least, just look around and check out her stuff. I'm pretty sure she'll appreciate it, and that you'll find something interesting along the way. She deserves her part of the cake for her contribution. All the characters above belong to Nintendo! Click here for commission information! I Like How Mario And Bowser Playing Dance Revolution! And Who Will Win? Dance Dance Revolution! The game that tricks people into exercising! Are they playing Mario dance mix? Bowser is not the final boss. Waluigi is the true DDR Master. What song would they be playing? I think they would be playing Rawest Forest, seeing as that song actually has a StepMania chart. I think Mario is going to win! I vote for Mario! There literally was a DDR Mario game in which Mario did do a dance off against Bowser. They got nothing on torpedoebeats. I like how Luigi's playing Donkey Kong in the background. Nice job. This was made in 2009, Max. wasn't on arcade and Paranoia Revolution didn't exist yet so I'm saying MAX 300. What I meant is it wasn't on arcade yet. 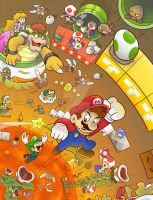 I like how Luigi is breaking the fourth wall in this. Ok maybe hes not. At first I thought he was. Mario and Bowser challenging each other in Dance Dance Revolution. You don't see that everyday. I have to say though, then scene looks amazing and I'll take a guess they are doing the most difficult stage they have yet at a highest level. Real men don't use the bar. Okay lets see if they can survive Megalovania. Yea it is well was it was a event. that sentence is horribly made, and the only way to get a craptale song into ddr would be to use a non-ddr program, like step-mania, to do so. Everyone! Place your bets here! I have shared this on my facebook page for Vs: Battle of Characters theme day! More focused on Luigi playing dk! Now if only we knew what song they were playing. Luigi is playing donkey kong?! Luigi just broke the fourth wall..
Luigi wants to be in DK. Wait, the bar behind the pad is there for a REASON? When I first seen this pic I think of that Sthamp on the Ground Music Video. Who doesn't like a good DDR battle? Nice!